I’ll be honest with you, here. Shhhhhhh—-lean in a little bit; I’ll whisper it to you: ….I don’t really like Valentine’s day. But having a kid, you start to see the silly holidays in a different light, for what they are probably MEANT to be, and right now, she’s at a stage where they’re just an opportunity to get some candy and give out fun cards. And that’s cool. I’m pretty alright with that. So when our daughter’s Pre-K class had a Valentine’s party last year, I looked around at some of the kid’s cards out there. Some of the sentiments in the pre-made cards always seemed a little too “lovey-dovey” for my tastes. I mean, they’re in PRE-K! I’m not trying to marry the girl off just yet! I’ve not ever been a big fan of many of the pre-made character cards, and while I realize she will probably insist on choosing some obnoxious character cards later down the road, right now she doesn’t really care WHAT they say as long as candy is involved…..so for now, I get to call the shots. Yay! And you can use ’em too, if you want to! They’re easy and don’t take much work. Just right click the image and save it to your desktop. Print it out on cardstock, and punch holes where the black dots are, and slip a lollipop stick in. I even cut around each one a little, just for something different, but you can just cut straight on the black lines to keep it easy peasy. And I don’t really think they’re THAT bad, are they? I softened it up with the “Love, Myla” part. Shoot, Pre-K kids can’t read anyway, but they know lollipops taste good, AMIRIGHT??? This year, with the overwhelming amount of candy I’m sure she’ll get, I thought we could be the ones that send the “different” ones, ones with little toys or something in ’em. I found some pre-made ones with little rubbery bugs (which our daughter loves), and I decided to keep the homemade theme going for as long as I can get away with it… Maybe “You Don’t Really Bug Me So Much.” Is that too long for a card? Heh-heh. Being artsy fartsy comes in handy sometimes! My college friend James Stowe knows that firsthand–each year, his son & daughter request themed V-day cards, and he creates them himself. A few years back, he made the CUTEST Star Wars cards that were all OVER the internet. He’s done Dr. Who Villains and Mario Brothers, D&D and now Firefly and he’s offering those over on his website as a printable PDF for only $3 apiece! So if you’re a humbug about Valentine’s Day (or even if you’re not), feel free to print my sucka sheets out for yourself. Or get some from an artist like Stowe. Or come up with your OWN! I may not like Valentine’s day, but I’d LOVE to see what you do! I feel the same way about Valentines Day. And these valentines are just awesome! I’m with you and Valentine’s day ~ tho I do love giving the little kids things like hand knitted hearts and Pez (just for Valentine’s). Thanks for the download ~ I love your designs!!! I feel that V Day is a holiday made up by Hallmark. I absolutely love your cards here!! Offbeat but definitely cool! Thanks for the artwork!! They’re cute! Though I must admit that I find the whole giving-all-the-kids-in-your-class-a-card-on-valentine’s-day thing totally bizarre. We just don’t do that here! At all. It seems like another totally unnecessary popularity contest to me (eh, that might be my own inner loner-kid speaking). Valentine’s Day is when you give a card to your significant other (or not, as you see fit), not something little kids celebrate. With the notable exception of anonymous cards from Granny/Grandad, of course. Ack! Loving the great Valentines! 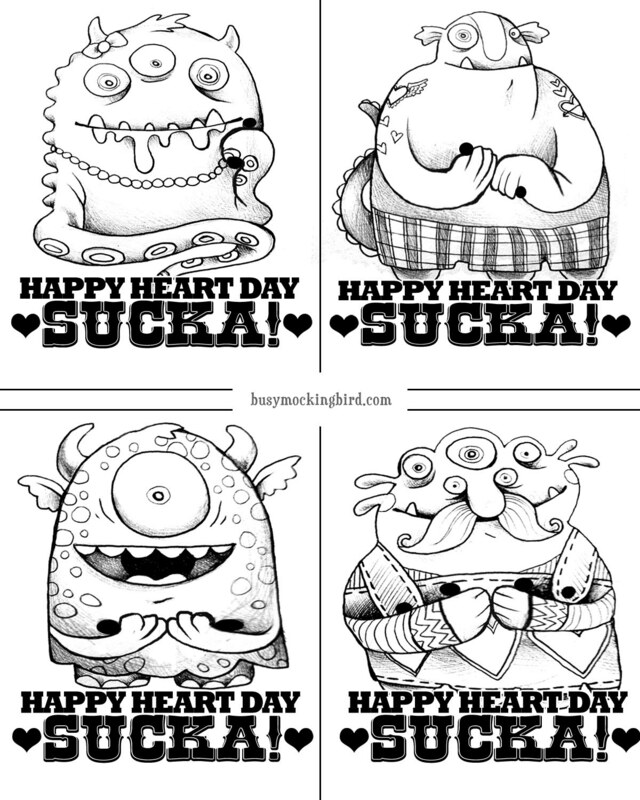 Thank you for sharing these neat-o monsters! So cool! Happy Anti-Valentine’s Day!! I think the store bought Valentine’s are corny too and I hate them. I had an idea to use printmaking this year to make some to involve the kiddo in making them and use her art too. They can be as lovey and girly or not as you’d like. I included a sucker in mine too! 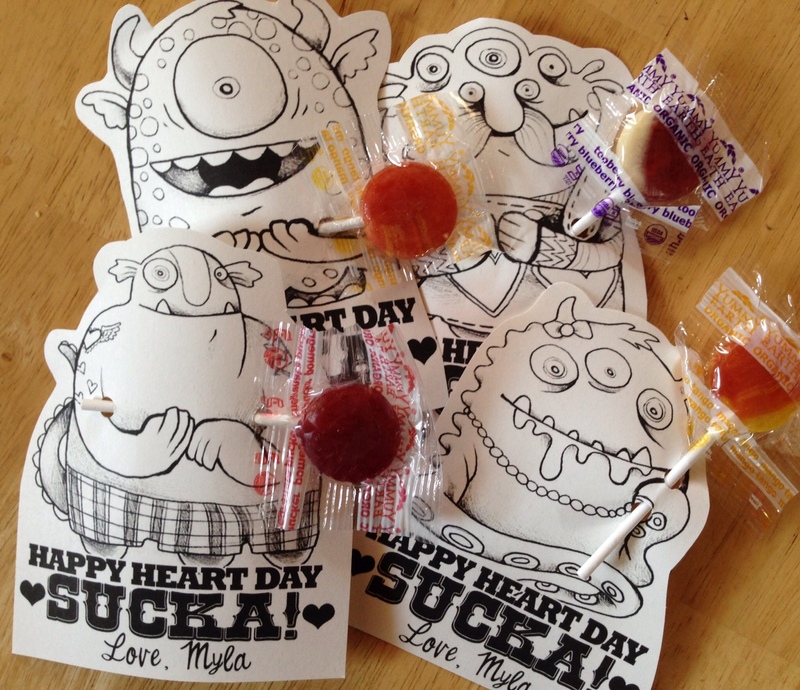 http://www.mykidsadventures.com/handmade-valentines-day-cards/. I love your idea – it rocks! Love the “bug” sentiment. go for it! Thank you! I adore you! And I dispise Valentine. Such a douche. I didn’t print these out but I told my son about them and he decided to make his own and write on them himself! Thanks for such a great idea!